Those little white lies aren’t so little. Have you ever lied on your resume? Can a white lie even be spotted by recruiters, and will it cost you in the end? 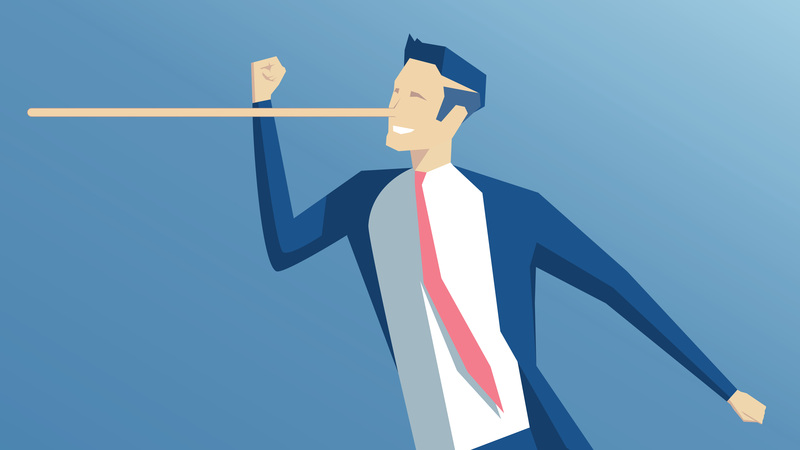 As it turns out, those lies are spotted more often than not — and yes, they can cost you the job. A recent study conducted by TopResume has found that over 77 percent of surveyed recruiters, hiring managers, and HR professionals have spotted a candidate lying on a resume. What’s worse, only 2.5 percent of professionals said that a resume lie would not cost a candidate the job. Whether it’s a complete deal-breaker or a dark mark on your candidacy, lying on your resume can get you in deep water during your job search. Don’t believe us? Keep reading for our collection of resume-lying horror stories, submitted by real recruiters, hiring managers, and HR professionals. The best story I have is about a guy who made up his sales experience. He didn't understand the position we were filling — we were looking for someone to answer phones, he thought he was interviewing for a sales job — and on his resume, he mentioned that he closed over a million in sales at his previous position. We were interviewing this guy as a favor, so we asked the person who was bringing him in about his sales experience. It turns out he was the assistant for someone else who did over a million in sales, and that guy was terminated for improperly handling account information. I looked at a candidate's resume and LinkedIn profile right before an interview and noticed his resume indicated that he had a degree while his LinkedIn profile did not. When I asked him point-blank if he had received his degree, he admitted that he had not done so. This is why I always look at candidates’ LinkedIn profiles in addition to their resumes before conducting an interview. A candidate came in to apply for a position as an adjunct professor. When we looked at the dates when he was supposedly employed as a teacher, they were off by a decade. Did I mention the position was for an adjunct professor … of mathematics?! A senior executive at my organization lied about his age when he first started working there. Later on, 30+ years later, when he qualified for early retirement, his lie was discovered. Unfortunately, this lie compromised his eligibility for early retirement. He had to pay one year of pension benefits out of his own pocket while we kept him on leave of absence without pay in order for him to qualify. Once, a management candidate falsely listed employment at a company that I was employed with during his supposed time of tenure. I asked him questions about his duties and responsibilities there and for the names of the other managers and co-workers. After I gave him the third degree, I discovered that he was using the stories of a family member. At the end of the conversation, I told him that I worked for the company. He began stuttering and finally came clean. I once had a candidate who noted he had graduated college. A tentative job offer was made, pending a satisfactory background check. But upon verifying the college degree, it was found that he did not graduate. He was short one semester. He explained the reason he left school, which we would have been fine with. However, the fact that he lied was a deal-breaker. We had an internal candidate list his title as Manager, Call Center when he was a Call Center Representative! How he thought we didn't know his title, considering he was a current employee, was beyond all of us! Once a candidate wrote that he was working as a Senior Recruiter for two years for a company, and I discovered that he was only a trainee. The shocking part is that he got a job with another company abroad based on that lie. Recruiting 101: Reference checks and background checks with the HR department are really important. One time I had a candidate who stated she had been working a temporary assignment for seven months through a staffing agency. When I asked her for more details about the assignment and what she did there, it came to light that she only worked a two-week assignment through them, but thought it was acceptable to still say she was employed because she was registered with them. There was a candidate who had worked for us previously, and just wouldn't leave! She wasn't really helpful, lived by her own rules, told us constantly how we should be running our camp, but loved it despite said camp not loving her. She applied for a co-director position (which wasn't open) and said she had previously been both assistant director and director at our camp (neither of which was true). When confronted about it, she said she forgot the prefix ”co-” on the latter position. I understand how some people might think they can get away with lying on a resume, but lying about a position you had at the organization you're reapplying to?!? The candidate was not forthcoming in regards to his skill level and achievements due to previous experiences where he was told he was overqualified for the positions he had applied for. His true abilities and accomplishments were discovered after he’d already been hired. Due to the downplay of his abilities, we offered him a lower compensation package than what he would have qualified for, which would’ve been two-thirds more. You shouldn’t need to lie on your resume to feel confident. If your resume isn’t making you feel proud, you may need a professional overhaul. Learn more about TopResume’s professional resume-writing services to help boost your confidence during your job search — no lying necessary. Start with a free, objective resume review from TopResume.